We see in our guru-gayatri, krsnanandaya dhimahi. This refers to both Krsna and Krsnaa. [Spelled in Sanskrit, k-r-s-n-a with a long 'a' at the end.] A male can serve Krsna, but no male can serve Krsnaa. Krsnaa is Radhika. Therefore, in his service to Radhika, for rati-keli-siddhyai, the perfection of Radha-Krsna conjugal love, a guru cannot serve in his male form. Parama-pujyapada Srila Bhaktivedanta Svami Maharaja and my Gurudeva are both serving there in their female forms as gopis [click "Unedited" green tab above to see acutal words]. In that realm my Gurudeva is Vinoda Manjari, Srila Prabhupada Bhaktisiddanta Sarasvati Thakura is Nayana Manjari, Srila Bhaktivinoda Thakura is Kamala Manjari, Srila Jiva Gosvami is Vilasa Manjari, Srila Rupa Gosvami is Rupa Manjari, and Srila Raghunatha dasa Gosvami is Rati Manjari. These manjaris can serve Sri Sri Radha-Krsna. Srila Gurudeva: If you fully surrender, by body, mind, words and ego, then I may tell you. Otherwise, I will not. I know who he is, but you do not know. None of the ISKCON leaders know. Your Prabhupada has cheated them all, in the sense that he has not revealed himself to them at all. He is rati-keli-siddhyai ya yalibhir yuktir apeksaniya. So, I offer pranama to my Gurudeva in that very form. 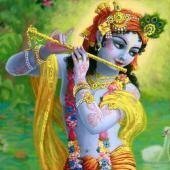 He is cheating others, and he is even cheating Krsna. By such 'cheating,' he brings Krsna to serve His most beloved Radhika. In Sri Caitanya-caritamrta it has been very openly told that Srimati Radhika is the guru of Krsna. Why not take shelter in the lotus feet of She who is the guru of Krsna? Our guru is there, in Goloka Vrndavana, serving Radhika. beautifulgdStill, if he is not like Rupa Manjari and Rati Manjari, and if he is not serving them, he may be a guru in part, but not in full. The highest quality of the guru is service to Radhika, as I have just explained. In this way, Srila Visvanatha Cakravarti Thakura is writing, vande guroh sri caranaravindam. I bow down to my Gurudeva, and all gurus in the line of Sri Rupa Gosvami. Such a guru is not only the prakasa (manifestation) of Nityananda Prabhu or Baladeva Prabhu, but he is also the prakasa of Radhika. Such a guru is the most exalted. As Ananga Manjari, even Baladeva Prabhu takes shelter of Srimati Radhika's lotus feet. How beautiful and glorious She is. Prema-prayjona dasa: Gurudeva, you said that a partial guru has controlled the six urges like vaco-vegam, manasa, krodha-vegam, etc. Such gurus, even with that partial quality, will not fall? Prema-prayjona dasa: Regarding the ones who have fallen down, they're not even partial gurus?